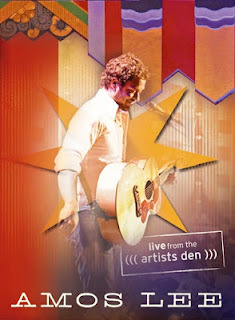 Singer/songwriter Amos Lee will be the subject of the latest DVD installment of Live From the Artist's Den, slated for release on March 12. The critically acclaimed series, which so far has showcased such artists as Adele, Crowded House, and Robert Plant, features pared-down and often rare or one-off performances in intimate venues. Recorded at the Fox Theatre in Tucson, Arizona in the fall of 2011 and aired nationally on PBS in the spring of 2012, the Amos Lee DVD will include seven cuts not shown on the television broadcast—among them is a sublime rendition of the Ray Charles/Willie Nelson classic, "Seven Spanish Angels," with Joey Burns of Arizona's own Calexico—as well as select interviews and behind-the-scenes footage. An MP3 audio version of Lee's full 16-song performance is already available for purchase.